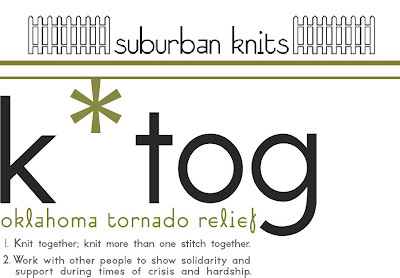 In the days after the devastation, Holly Barcelo and Lars Rains of the design collective, Suburban Knits, felt the need to help in some way. They thought of creating an ebook of designs for charity, and they invited other designers to contribute as well. Holly and Lars wanted to get the collection together as quickly as possible, so they requested patterns that were already up on Ravelry. I contributed my Jemma Cowl pattern to this ebook, which remarkably,was ready for purchase by June 3rd. K*tog is a collection of 20 patterns by 19 designers and will be available from now through August 31 for only $20. All proceeds from the sale of this ebook will be donated to Other Options, Inc. a food pantry in Oklahoma City that is shuttling supplies to the affected areas in Oklahoma. The k*tog ebook can be downloaded here where you will also find a table of contents and thumbnail photos of all of the designs in the collection. k*tog has a pattern page on Ravelry, where, as of today, nine of the patterns are linked. There is such a great variety of patterns in the collection which includes socks, hats, shawls, cowls, a vest, a cardigan, a pair of mitts and even a baby cocoon. Truly, something for everyone! What a great idea and how nice of you to contribute - that is such a pretty cowl pattern.